We offer a small yet cozy apartment for rent, studio apartment that is 30 meters squared in size, located in the closed and secure area of Albertov Rental Apartments in the center of Prague. 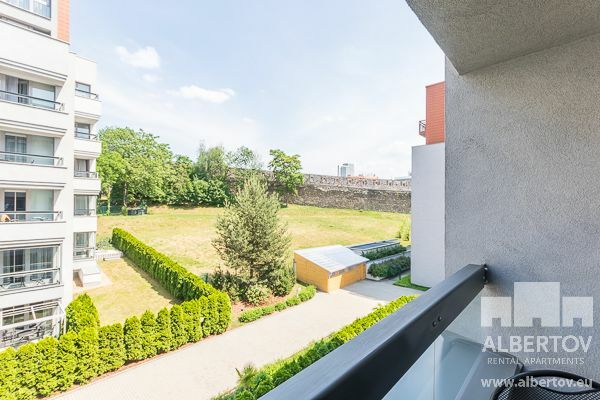 The apartment is located on the 2nd floor with a soothing view of the greenery and directly on the historic Vyšehrad wall. You can sit on the balcony, that can also be used during the winter months as a “winter garden”. As far as apartment equipment is concerned, you can expect high-quality, custom made furniture and energy efficient appliances. 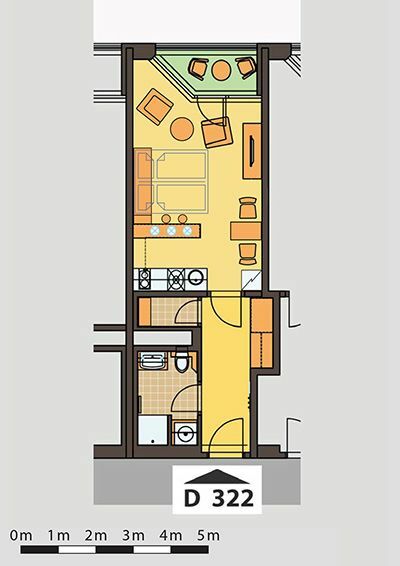 In the bathroom you will find a shower, washing machine with a dryer and pleasant floor heating. The room is cleverly divided by the bar counter into the kitchenette and the living area. The kitchen is fully equipped with electrical appliances such as, a microwave, dishwasher and more. Folding bed with high quality orthopedic mattress is suitably chosen for its practicality and space saving. Of course, there is an LCD TV with a satellite that you will enjoy watching from a comfortable armchair. Wi-Fi connection is included because it must not be missed in this century. Renting this apartment cannot be missed, for its comfort.